Stores reference 22c/769. Size 10. The leather is in reasonably good condition. 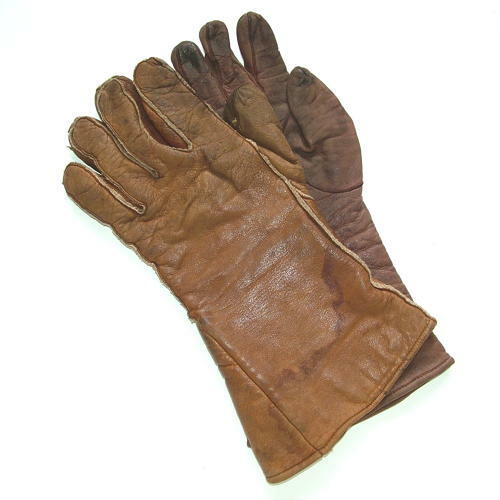 Both gloves remain very soft and supple but are a little rubbed and have stains. The colour match is rather poor but they do appear to have been used as a pair. The blanket fleece linings are quite good and each glove is labelled. 'Left' and 'right' hand gloves were manufactured separately so poorly matched gloves are very common. This pair also has variation in the 'cut' so are not identical. Stock code GA20796.